Situated in a Grade I listed building, the Oxford University Museum of Natural History has an outstanding collection of zoological and geological exhibits including crabs collected by Charles Darwin on his voyage. As well as the nest of swifts on the museum tower, which can be viewed on a live webcam, the museum features extinct dodos and dinosaurs that once roamed the Oxfordshire countryside. The museum is well set up for family visits with exhibits geared towards younger visitors focusing on fossils, insects, dinosaurs and dung beetles. Permanent exhibits fill in our knowledge about the history and diversity of life on planet earth including evolution, primates, vertebrates, minerals and rocks. Author Lewis Carroll brought Alice Liddell to visit the museum when he was a mathematician at Oxford and some of the exhibits, such as the dodo painting, inspired his characters in his stories of Alice in Wonderland. Who know what inspiration the exhibits may provide for today's young visitors! This natural history museum was envisaged as being a "cathedral to science" as well as housing the extensive natural history collection belonging to Oxford University. The building's design was based on the artworks of John Ruskin and is decorated with carved sculptures of plants and animals. The museum was opened in 1860 to bring together the scattered collections previously cared for by the Honour School of Natural Science. This fabulous neo-Gothic building once housed the Oxford Evolution Debate in 1860 between Thomas Henry Huxley and Bishop Samuel Wilberforce. The lecture theatre was also used to host the first public demonstration of wireless telegraphy in 1894. In the main hall, the sight of two dinosaur skeletons provides a spectacular welcome for visitors along with displays about Alice, the dodo, Oxfordshire dinosaurs, minerals and insects. The mineral collection at the Oxford University Museum of Natural History is considered one of the oldest and most comprehensive in the country. The display is just a small sample of the 30,000 specimens of crystals and minerals which are used for research at the university. The insects display is among the top 10 collections in the world and specimens date back to the early 18th century. There is a tsetse fly collected by explorer David Livingstone from Africa and many moths, crickets and butterflies. The zoological collection is even more diverse with samples being used for classifying and studying the biodiversity of the earth's creatures by scientists and students as well as being on display for museum visitors. There are samples from all five groups of the living kingdoms: plants, animals, fungi, bacteria and single-cell organisms. Other points of interest not to be missed are a meteorite, many fossils, the replica footprints of a Megalosaurus across the front lawn and a large number of preserved animals and birds. 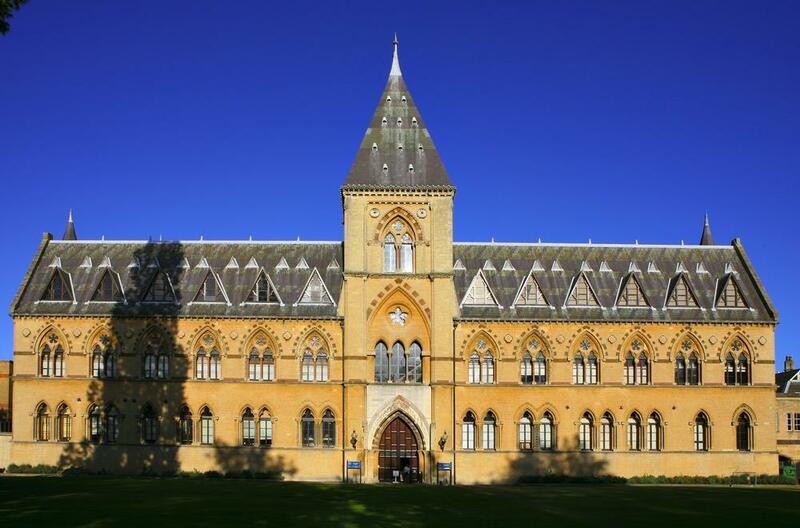 After exploring the Oxford University Museum of Natural History, visitors also have access to the adjoining Pitt Rivers Museum which is the ethnological arm of the Oxford University museum collections. Open 10am to 5pm every day. Closed 24th - 26th December, 31st December, and 1st January. The Museum is about 10 minutes walk from Oxford city centre and about 15 minutes from Oxford station. There is no public parking at the Museum, although disabled facilities are available to registered users.